What Draws You To A Quilt? I suppose any rationale for why you like a quilt is ex post facto, like love itself. You have a positive emotional response and then you try to parse the reasons for it later. The quilt below made from a Mary Mashuta pattern rang all my bells when I first saw this picture. One, I love curves in quilts; two I love stripes (though I wish the quilter would have made sure the striped fabric on the inner right formed a mitered corner;) three, I love the hand quilting that curves around the central motif; four, I adore the plump curvy binding. And I haven’t even mentioned the Kaffe Fassett fabric. The quilt below is so unlike anything I’ve ever made or am likely to make, but I love the way it contains our entire world in what looks like a snow globe. It’s a message quilt, but has wonderful balance and I’m a sucker for trees. Look at the village in the distance and the way the branches seem to embrace the sun. And the color scheme – mostly taupes – is so not on my radar, but I love it here. Jean Wells (of the Stitchin’ Post) makes quilts closer to what I hope my work will become. 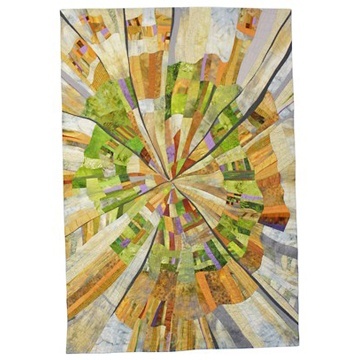 She started out in traditional quilting and her work has become more abstract with time. Her recent work is based on close observation of the natural world. It transforms rather than reproduces photographs she’s taken. “Cross Cut II” below is Jean’s interpretation of a tree cross section. I love the periwinkles and greens she used and the radiating spokes. I just bought her latest book, Journey to Inspired Art Quilting, and am savoring it like a box of really good dark chocolate. Lovely post! Beautiful quilts and ones which really draw you in. Not sure I could describe what makes me love a quilt, although one thing that all 3 above have in common is excellent design. Oooh, thanks you bringing up that essential basic – good design. No matter what the quilt style or colorway, a quilt won’t shine without it.